The only thing that makes me happier than a satirical video game is a satirical video game that plays like it means business. Too often I have seen developers pay more attention to poking fun and making a point than actually focusing on the mechanics of a game. Luckily, Broforce from developer Free Lives is the best of both worlds: a brilliant satire of action flicks that actually provides a legitimately fun and challenging gaming experience. Satan has not only appeared on Earth, he has assembled a terrorist group in order to threaten freedom worldwide. You assume the role of the titular Broforce, a paramilitary group tasked with defeating Satan and his terrorists and bringing freedom to the entire world. New Bros are unlocked when you rescue hostages in each level, each with versatile abilities and weapons. From Rambro's machine gun to Brobocop's targeting system, Bronan the Brobarian's Atlantean sword to Double Bro Seven's special martini attack, none of your favorite iconic macho characters have been spared. Every time you die, you're swapped to a random new Bro. Despite being visually simple the Bros are extremely varied, with some showing more strength with melee attacks while others having more powerful weapons. Some have speed, where others have increased firepower. The random swapping adds a unique and unexpected puzzle element to the process, making an otherwise predictable game refreshingly unpredictable. The levels each mostly follow the stereotypical action film formula of beat bad guys, save good guys, go Michael Bay on everything, and ride off into the sunset. In a chopper. That being said, the biggest mistake you can make with Broforce is underestimating the game. While Broforce offers a mostly fair challenge, it most definitely inspired a decent number of temporary rage quits, and I discovered (invented?) a few new curse words that would even make my badass Irish mother blush. It is brutal and chaotic, but never to the point where it stops being fun. Nearly every surface in each level is as destructible as the enemies you will face, making for plenty of mayhem. This is perfect for traps, sneak attacks, escapes, and of course, destroying things. After a few hours, you'll probably feel the urge to cut down a tree or shoot something for dinner. Don't be alarmed: That's completely normal and mostly expected. 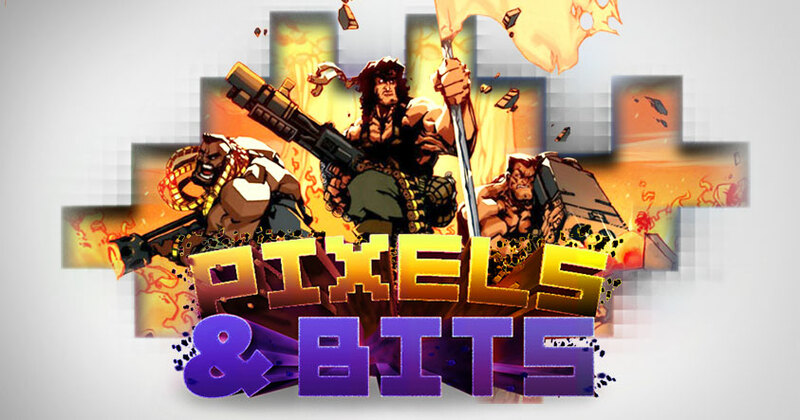 Broforce is a love letter to classic testosterone-fueled action movies, a like letter to to run 'n' guns of gaming past, and a fondness letter to side-scrolling 2D puzzle platformers. This is not a compliment I throw around freely, nor do I say it without appreciating the gravity of what I am saying: Broforce is basically the new Contra, wrapped in an American flag and armed with all of the guns, with a side of bacon. My computer predictably grew a beard as soon as I booted it up, and I'm pretty sure an eagle flew past my bedroom window and nodded in approval. Broforce will put hair on your chest, whiskey on your breath, and will probably even make you go through a second puberty. It's almost exactly what I would expect if someone were to tell me that there was going to be a Hot Shots! Part Deux video game, except better. I don't believe in lying to my readers, so I openly admit to listening to "Now You're a Man" from the Orgasmo soundtrack when playing it, and I feel no shame for that. In fact, it's how I recommend you play it, too. In all seriousness, though, underneath the game's testosterone-fueled silliness, cheesy puns, and bulging biceps, Broforce is a legitimately entertaining, challenging, and unexpectedly versatile game that serves as respectful ode to both retro gaming and 80's action movies alike. The rotating characters ensure a different experience every time you play, and add a unique puzzle element to a game that could have otherwise fallen into a slump after a few levels. It's a surprisingly reverent homage when you look at the impressive amount of attention to detail given to each individual character. Broforce is a brotastic masterpiece of epic broportions. Bro. Basically, the only reason to not play this game is if you hate freedom.